Steve Emt, Kirk Black and Penny Greely return for the team which took part at this year's World Championships and will be joined by Justin Marshall and Meghan Lino. Emt, Black and Marshall will all make their Paralympic debuts. "I'm blessed and I'm fortunate to compete and get a chance to represent our country," said 46-year-old Emt, who skipped the team at this year's World Wheelchair Curling Championship. The Worlds were held at the Gangneung Curling Centre in March, the same venue which will be used for the Paralympics. Black, 48, began curling a few years ago and has quickly excelled, but Marshall, 31, was a member of the last two World Championship teams. Greely, 46, and Lino, 33, were part of the American team at the 2014 Paralympics in Sochi, where the United States finished fifth. The former was also a member of the 2004 Paralympic sitting volleyball team, which won bronze in Athens. "This is the tightest field we've ever had and probably the strongest women's field we've ever had," said team coach Rusty Schieber. 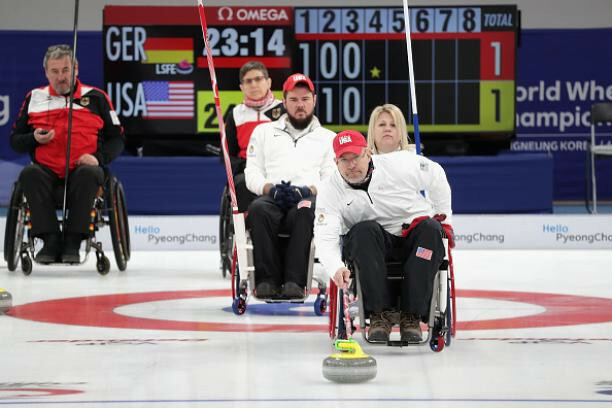 Twelve countries will compete for gold in wheelchair curling, with the US team seeking its first Paralympic medal in Pyeongchang after finishing fifth in 2014, fourth in 2010 and seventh in 2006. "I know that we'll all be training hard to be ready," Emt added. "There's no pressure to medal, but when we do it will be a huge accomplishment." The team selection began with pre-trials in September 2016 in Blaine, Minnesota, followed by a further selection process at Wausau, which narrowed the field this week. The Player Selection Committee assessed and ranked the athletes based on skill-shot analysis, game play and other qualities such as on-and off-ice behaviour, team dynamics and practice regimen. Athletes' game knowledge and performance was also taken into consideration.